You found your way here because you value your landscape. Great spaces are well designed and really work. Beautiful landscapes are carefully built with precision and craft. The best gardens improve with age. Is that what you want in a landscape? The first easy step is a free landscape design-build consultation. Ben Bowen, third generation landscaper, will walk your property with you and discuss your goals for the space. Our family will work with yours to create outdoor spaces that feel and function just the way you want them to. Andrea F. "...it took us six months to get on Joe's construction calendar! Even though the wait time was frustrating, it was SO WORTH THE WAIT. Our home was beautiful, but our front and back yard are now stunning. Our neighbors regularly stop by and thank us for re-doing our yard. I thought our yard was only distasteful to us, but obviously not! Joe was terrific to work with: responsive, accommodating, easy going, and just a really nice guy. Anytime I had a question, he was there. Any time I've had a concern, he reassured me. If there was a problem, he came down to fix it himself." - Excerpt, read entire review here. We are landscape contractors who design and then install landscapes that fit the way you live. When you work with Ross NW Watergardens you get a team of designers and craftsmen who will collaborate with you to create a landscape design tailored to your family's needs and style. Visit our landscape services page for a full list and our portfolio for examples. Or just send us a description of your project and we will let you know how we can help. When you call, email, or fill out a contact form Ben Bowen will communicate with you to discuss your project and set up a free landscape consultation. Ben serves as your landscape designer, provides you with proposals for your project, and will be your primary contact through the entire landscape design and build process. Ross "Joe" Bowen, with over 40 years of landscape experience, started Ross NW Watergardens. He will personally oversee the installation of your project from start to finish. Your garden will take shape with him guiding our skilled crews. Our crew leaders have all been with us over a decade, we really are a team! Jose Ortega, who happens to be Joe's son-in-law, is our landscape manager. He will ensure your project runs smoothly by organizing all the materials and equipment that are needed to make your landscape design a reality. Learn more about us here and access all of our happy client's reviews here. 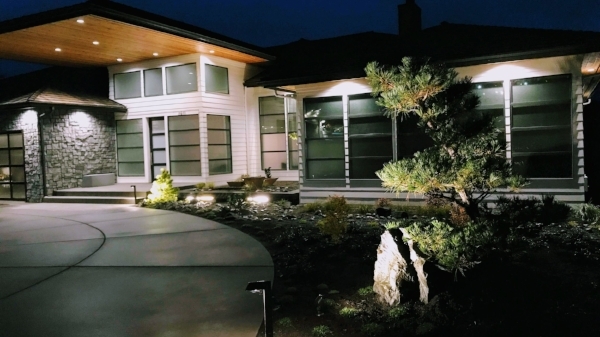 We offer landscape design and landscape installation in the Portland-metro area (and occasionally beyond). This includes Portland, Lake Oswego, Dunthorpe, Wilsonville, West Linn, Clackamas, Tigard, Tualatin, Milwaukie, Happy Valley, Beaverton, Hillsboro, and Oregon City in Oregon. In Washington we take on projects in Vancouver, Ridgefield, and Camas. We also have completed project in Hood River, Lebanon, Canby, and on the Oregon Coast. If your project is outside our normal service area, but is challenging or unique, please let us know! From the initial contact to the final walk through (1) communication is key to the success of your landscaping project. Ross NW Watergardens works hard to keep the dialogue going. We are never confrontational, but deal with unexpected issues head on. (2) Quality is the most important thing to us. We respect budgets and your design preferences, but your new landscape has to work well for years to come. Your landscape will look great when we finish and improve with age. If we can't deliver a beautiful landscape in your budget we will let you know. (3) We are easy to work with. Ross NW Watergardens takes a flexible approach. We are pragmatic, never dogmatic. Our experience will blend with your preferences to produce personalized solutions to your landscape challenges. We will work with you, your architect, your general contractor, subcontractor, inspectors, and anyone else involved to make sure your project goes smoothly. Our highly skilled crews have the (4) experience and ability needed to create truly beautiful gardens. It has taken decades for our crew leaders to develop their craft. Your landscape will be proof of that. Ross NW Watergardens is licensed (OLCB# 9085), bonded, and insured. We have hundreds of happy customers in the greater Portland metro area, dozens of 5 star reviews, and have completed landscape design-build projects all over the Portland, Oregon and Vancouver, WA area.